I want to concentrate my attention in this post on reasons for and methods of bird observations. I guess this introspection was prompted by a comment on my blog post last week! This comment mentioned a "computer tick" for a bird! I don't do "lists" (not even grocery lists!) and neither do I do "ticks"! So just what am I trying to accomplish by observing and photographing birds? Here is the retrospective! When I moved up here I knew very little about shorebirds. I bought a kayak and started seeing groups of shorebirds roosting in various places. Simple curiosity made me want to identify what I was seeing. (And that is another long story!) Then I learned that shorebirds (with a few exceptions!) are site specific and also that their numbers are decreasing every year. I wanted to find out if this was the same for the birds and the roost sites I was observing around here. So here is what happened. This is where I first started kayaking and is taken from the Mullens picnic area looking out towards the roost site that we now call the Airport Roost. This photo is looking back towards the picnic area from the roost area. 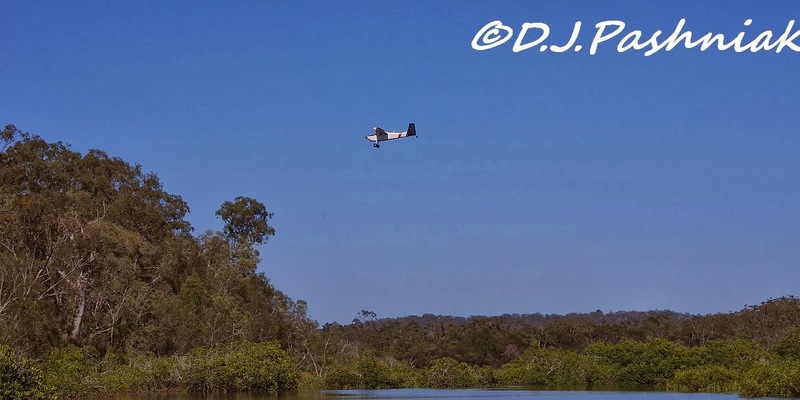 And this photo is a small plane coming in to land on the nearby air strip and shows why we have named this roost site the Airport Roost. 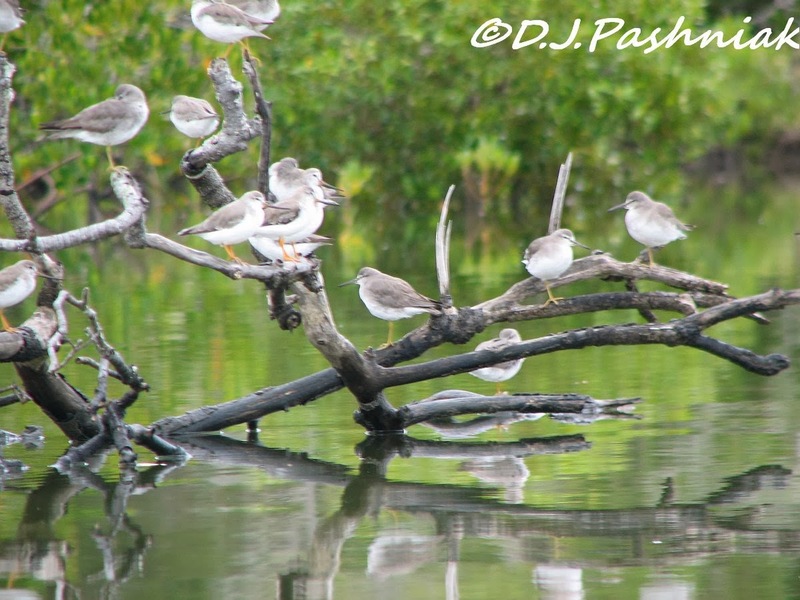 The first shorebirds that I saw were Grey-tailed Tattlers and Terek Sandpipers in an old dead mangrove tree right next to the channel of the creek used by all the boats from the Mullens picnic area. This photo was taken in April of 2006 with my first digital camera - a 3 MP Kodak. By March of 2007 - the end of that same summer - the tree right in the channel had fallen down and the birds were now making use of a tree at the end of the creek and just around into the bay. I have no photos for the next couple of years. On memory I still saw some birds at the site but did not manage any photos before they flew off so have no idea of their numbers or if both kinds of birds were still there. 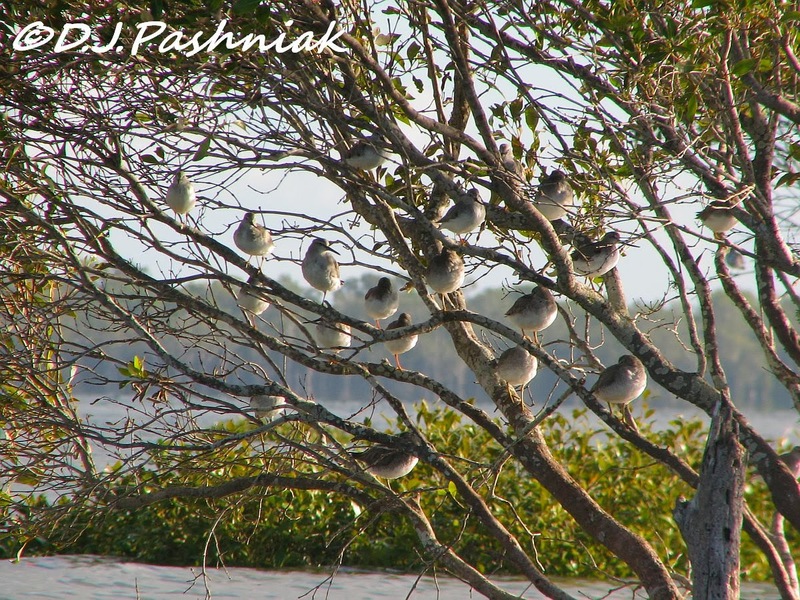 The next photo was taken in November 2010 and the birds were roosting on mangrove roots on a not so high tide. 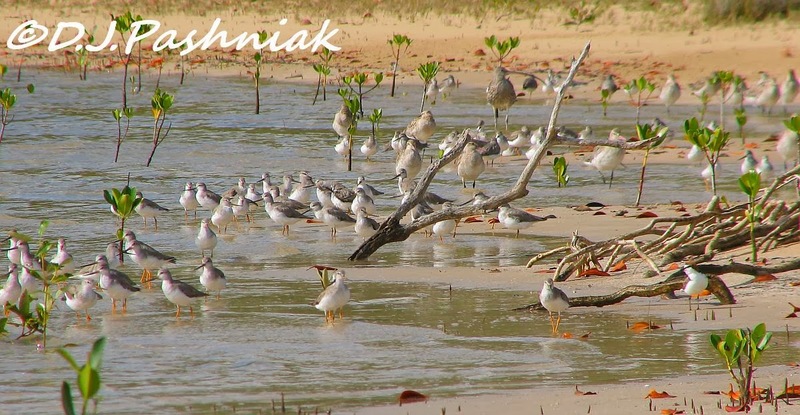 The next photo showing both kinds of birds is September 2011 and a few were roosting along the sand. I have a similar photo taken a little later in the season. I have no photos showing both kinds of birds until just this month when I photographed Terek Sandpipers in the roost tree just after the Tattlers had flown off. I know the Tattlers have been there all this time and I have taken a number of photos of them by themselves both right on this roost site and also a little further away where there are other mangrove trees where they sometimes roost. All these photos show that this roost site has been used over a period of the last 8 years. 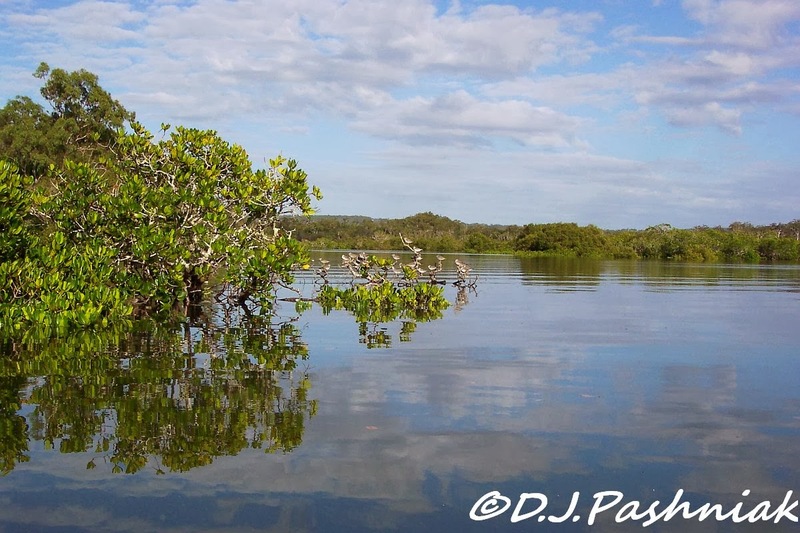 The birds prefer to roost in the large Grey Mangrove trees with open branches where their view out is not restricted by small branches and leaves. The count data I have recorded shows that numbers are now less than half of what we first counted. However, the population of the town has increased over the same period and there are more housing developments being planned. Possibly some signage right on this site might help and also some more specific publicity. seeing them roosting in the trees and on the roots - really very cool! Thanks Therese, I think so too! Great post and very good site data records. Thanks Neil. Now to get it protected!! Thanks Carole - I love this area. Mick, it looks like a great habitat and roosting area for the birds. Your photos and post is great. Thanks for sharing! Enjoy your week! I enjoy watching birds and find it very satisfying if I can identify them. Thanks for commenting - I find the shorebirds easier than the bush birds because I see them more often. It was interesting to read the description of your bird "awakening" which is so familiar to me and I'm sure to many others. You are doing extremely valuable work in watching and counting this site on such a regular basis. Because you have noticed and documented the decline in numbers I hope the site can become safeguarded and more widely recognised. Good for you in not having a "tick" list. Hi Phil, thanks for your comments and your encouragement. I am sure that some of the decline in numbers at this site has come from disturbance at the site. I have an article and photo coming out in our little local paper this month which hopefully will raise awareness. However, the much bigger problem is the decline in overall shorebird numbers which is being caused by excessive industrialization and draining of the tidal flats up in the yellow sea area - this we have no control over! All of this is important stuff. Ticking is rather boring:) I still can't get over those sandpipers. They are really unusual behavior wise....what a unique look. I see habitat degradation all over the world and it's a bit scary....even in my own backyard. People don't seem to get it. But when you observe the wildlife, plants etc on a daily basis, it's not hard to see it all unfold. Hi Chris, I wish I could see more or the sandpipers that yous see over your way. The only other common one around here is the Curlew Sandpiper which usually roosts on the sand but can occasionally also be found roosting in the mangrove trees. It is such a pity that there is so much habitat destruction everywhere. I all catches up on us eventually! Hi Sally, and thanks for commenting. 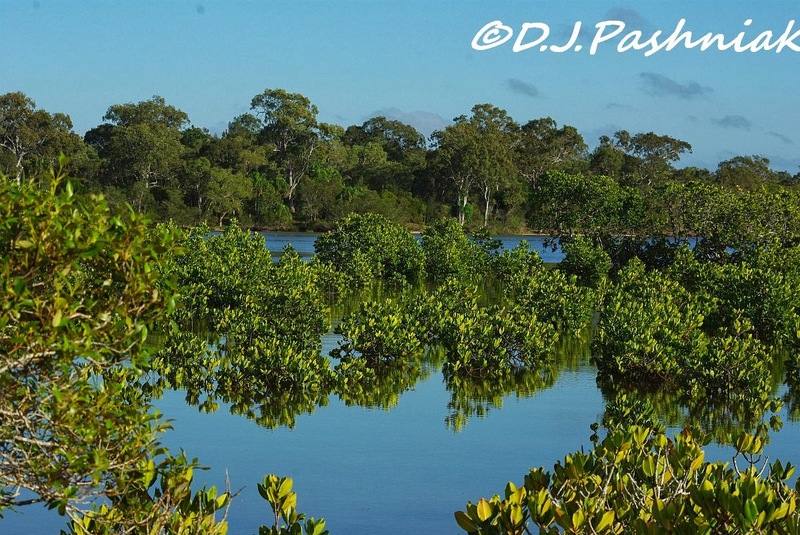 This whole area is supposed to be protected - it is listed under various treaties as a wetland of international significance - but if the local people don't see how special and beautiful it is then it is gradually degraded. Beautiful photos, but it's sad that the populations are declining. Thanks for commenting Gunilla. Populations will continue to decline until all countries and people take care of the birds and the habitat. That area is so beautiful. I always enjoy your photos, and think how great it would be to paddle their. Bird/animal/ fish/reptile/insect populations are declining all over the world. It's sad and frustrating, if only more people would get out in nature, and see what beauty there is to be cherished and saved. Thanks for your comment Karen. I do like the idea of nature being cherished. We certainly need to show others what we are about to loose unless something drastic is done. 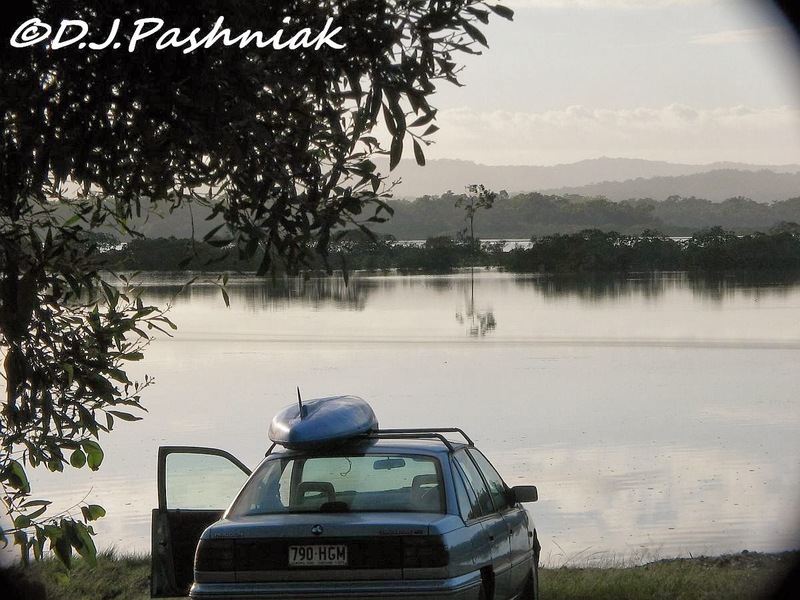 Thanks Carole for commenting, It is not just being on the water but being very quite on the water - perfect kayaking! I so enjoy your photos, they are so clear and the birds look so awesome in their natural habitat. Thanks for your comment Bettyl. It is so interesting to see how the congregate at roosts like this. Wonderful photos! Thanks for commenting Kenneth, I only recently realized that tree roosts are not as common in other places as they are here. A very sensitive post. The best bird-watchers like the best artists, are the dedicated amateurs who do it for the love of it and for gathering information for their own satisfaction and not to show off to anyone else. Thanks for commenting Arija and thanks for your encouragement. 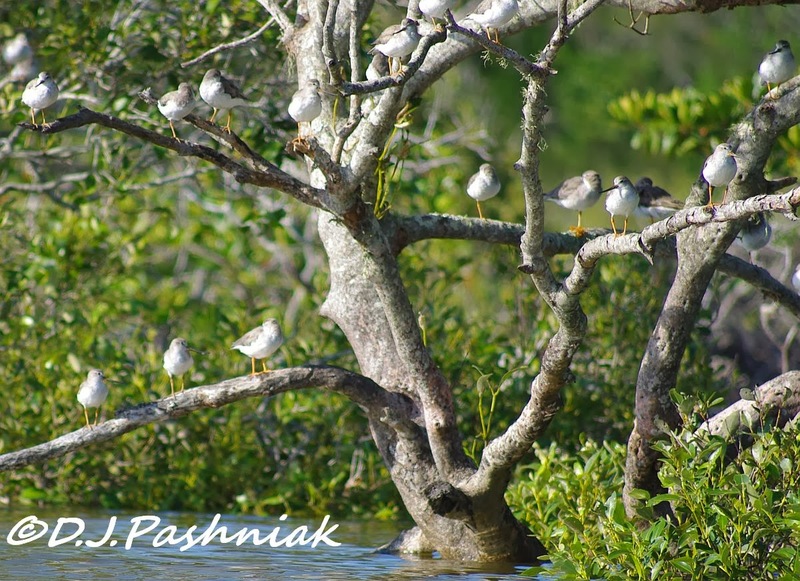 Being on the water gives you a wonderful view of the birds' favorite roosting areas, Wonderful series. Thanks for commenting. These roosts can only be seen from the water. I wish I had a kayak to see birds the way you do! Ah hah! You could always come and use mine!! But hurry because the birds will be leaving soon! Now who would use a term like "computer tick"!! I often think about the same sort of issue when I am taking pictures - would a trade really good views of bird for reasonable pictures? The use of "computer tick" (in who ever's comment it was in!) 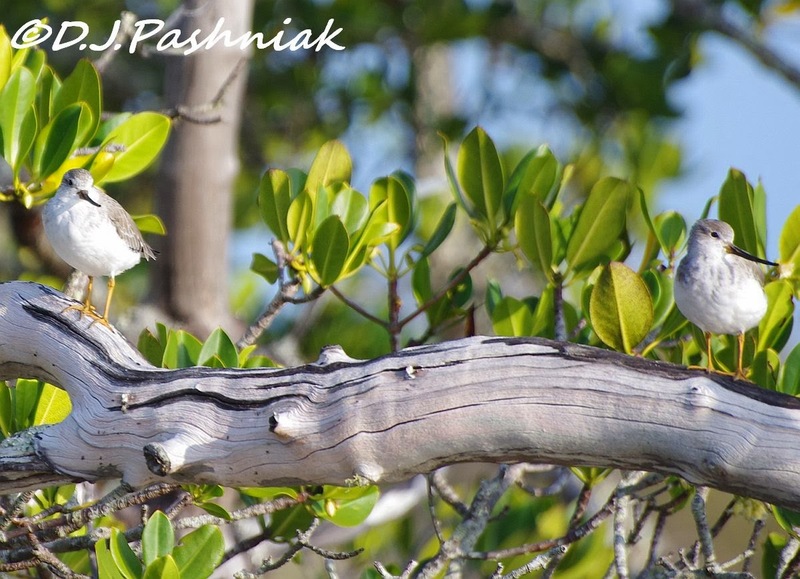 is about finding birds you did not know were in frame when you look at the image! Thanks for your comment Stewart. Unfortunately I am getting slower at IDing a quickly flying bird and I would rather have a photo to be sure of what I "think" I have seen than be left with a question in my mind. I think the only "computer tick" as you defined it has been when I have occasionally seen a leg flag in a photo when I haven't seen it when scanning across a flock of birds. I tend to look at heads and bills before I look at legs and feet! Mick, this is really an interesting post for me. 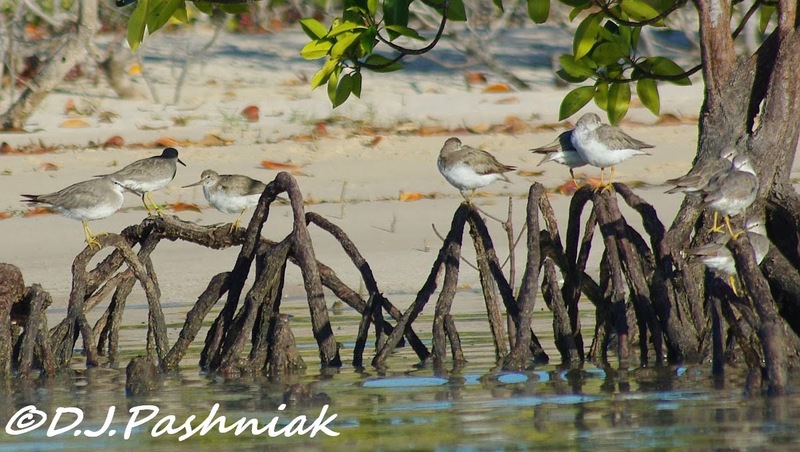 Protecting a specific area, such as your sandpiper roost, is important, but can be all for naught if no consideration is given to development of the surrounding areas. You are doing important work! And by that, I mean, important to YOU! The rest of the world is better for it. Thank you. Hi Wally, thanks for the encouragement. Pressure from development is heavy wherever there is land close to the water. But if people can see what is already there then they might be more open to at least setting up buffer zones around the roost area.